How to teach fundamental (boring) skills that our learners need to be able to successfully share their story? Common knowledge of word type and how sentences can and should be structured, is not a strong skill in ESOL children. Therefore, we make sure to explicitly teach this in our classrooms. By bringing text back to the basic sentence level, students can play with words without feeling like they are having to write masses of text. 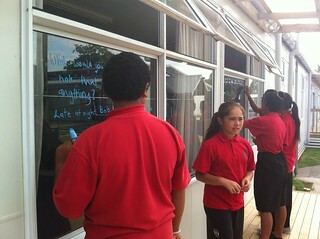 In this activity students were able to use colour, discussion and even write on walls to share their understanding. 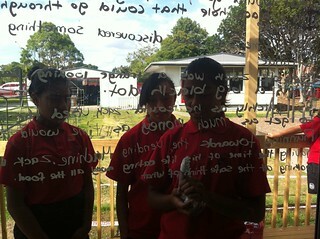 The learning happened as students discussed their sentences, read others around the classroom and shared ideas. 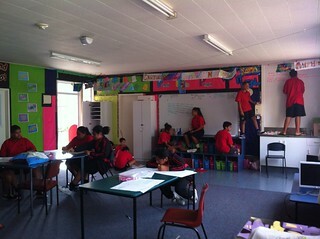 Even more learning happened at break time as students from other classrooms came to see what the colourful writing was and asked questions, discussed the writing and imagined what the sentences were all about. Basic and simple - yet effective.